There are some books I truly distaste reading. 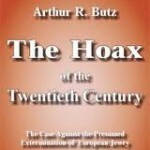 The Hoax of the 20th Century by Arthur Butz is one of them. An associate professor at Northwestern University, he wrote one of the key books in what is being called “historic revision” of the Holocaust (read: Holocaust denial). To this day Butz denies that the planned extermination of the Jews by the Nazi regime in Germany during World War II ever happened. Butz denies it on technical grounds since he is an expert on the technical side of how to carry out operations and on how machinery work. Butz denies the planned extermination of the Jews because the ovens and gas chambers that were in use at the time could “not” dispose of so many people so quickly at any one time. Further, Butz states that there was “no” actual document which formulated the Final Solution to get rid of all the Jews in Europe plus other undesirables that the Nazis marked for extermination or enslavement. In the conclusion, Butz comments that the whole thing was a “hoax” planned by the Jewish Zionists to extract money from Germany. There are a whole myriad of problems with the logic of the book. First, the book does not look at the logistics of the whole system that was put in place to kill not only all of the Jews but anyone else the Nazis found inferior. The Nazis used death squads, huge burning pits inside and outside of the Nazi death camps. The Nazis simply slaughtered whole villages—some with only Jewish residents—and called these mass extermination efforts “anti-partisan operations.” Finally, the Nazis did have indeed a blueprint for the extermination of the Jews and all other undesirables—the Wannsee Conference. Documents still preserved to this day show that all Jews were to be deported to Eastern Europe where they would be worked to death and all of the remainder would be killed. Later documentation from the former German SS and Gestapo would corroborate this. And of course, Butz never interviewed one survivor of the Nazi death camps. Apparently, “none” of them could be trusted. One has to ask the question how can all those who survived say that they were not marked for extermination and that they had not seen so many people killed? Are they all a part of the Zionist plot? We also have testimonies from neutral organizations like the International Red Cross in Switzerland that corroborated the atrocities committed by the Nazis during the war. If it wasn’t so sick, the book would be considered laughable. Apparently witnesses and physical evidence and the very facilities used to kill huge numbers of people is not enough to convince Butz of there indeed having been a program of killing people on a major scale. From a personal viewpoint that clearly Butz will never understand, having witnessed the June Fourth Massacre in China, intent is as important as the means to commit atrocities. Before World War II, the Nazis had very much the intent of ridding not only Germany but all of Europe of all Jews and others deemed inferior. Before the war, the Nazis had no problem killing people in the first of the concentration camps that were built in Germany, and they had no problem killing Jews and political prisoners in prisons by brutal and sadistic torture as well as by lethal injection. Even with what I feel about the book, I recommend that my readers should rent a copy (don’t bother buying one) of Butz’ book and read it. It is clear that the author not only denies the undeniable but clearly does not understand the dark side of human nature.